Ada has always adored art, taking classes since the age of 7. In 2006, Ada created her first portfolio and was accepted into the prestigious ARTS YORK program at Unionville High School. This program holds annual auditions and interviews, accepting only a few students per year. drawings. Also, she has specialized training and learned all her technique within the past 20 years. 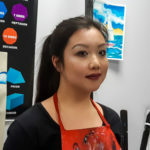 She has been teaching private art lessons for kids for 2 years and has also helped students prepare art portfolios for high school and university applications.